Silver Colored Metal Charm & Ring. Elegant silver-colored metal 1.38" x 1.38" square keychain. You can also choose to change this to a 2" x 2" size available. Price varies with sizes chosen. Choose between basic button style keychain and premium silver-colored metal keychain styles. Price varies with style chosen. Premium silver colored metal keychain. Choose between two sizes. 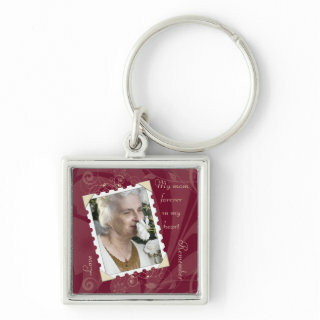 Zazzle keychains are printed and shipped in the US, even if ordered off of international sites. Please allow sufficient time for international shipping.